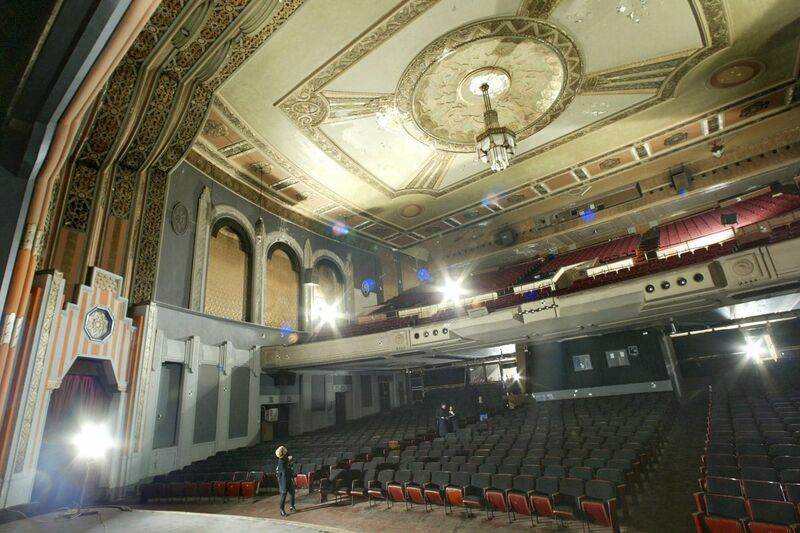 The interior auditorium space of the Boyd Theatre in Center City, which underwent demolition starting in 2015 after a developer was able to qualify for a financial hardship, allowing for most of it to be razed. When working at its best, local preservationists say, Philadelphia's historic preservation system can produce development feats as fairy tale-esque as the Divine Lorraine, the hulking, 1890s-era Victorian building that towers over North Broad Street. Abandoned and decaying as recently as a decade ago, the newly renovated apartment building is one of Philadelphia's preeminent preservation successes, having leveraged federal, state, and local grants and tax credits, as well as government and public support, to save the prominent structure. But at its worst, those same preservationists argue, Philadelphia's system can leave the city with holes as deep and large as the one on the 1900 block of Sansom Street, where the Boyd Theatre's auditorium once stood. Its exterior listed on the city's historic register in 2008, the Art Deco theater just a few years later succumbed to development pressure anyway, when the Philadelphia Historical Commission granted the developer a hardship exception, greenlighting the razing of everything but the theater's facade. Yet somewhere in the middle of those far-from-ordinary cases is where Philadelphia's preservation system most typically operates today. Indeed, there have been other recent victories for preservationists: Graduate Hospital's First African Baptist Church and Fishtown's St. Laurentius, for example. And developers have had plenty of wins, too: the rowhouses near Wills Eye Hospital, or Jewelers Row. Behind the scenes of such high-profile dustups is a city still trying to figure out its preservation strategy — especially amid a period of rapid real estate change. Despite staking its claim as America's birthplace, or having the second-highest number of properties nationwide built before 1945, Philadelphia drastically underperforms its peers when it comes to historic preservation. Philadelphia’s historic Divine Lorraine, which now operates as apartments after developer Eric Blumenfeld took on the project. Many preservation researchers and advocates have pointed to it as an example of historic protection at its best. Compared with a 50-city nationwide average of 4.3 percent, Philadelphia has placed just 2.2 percent of its buildings on its local historic register, saving them from demolition, the National Trust for Historic Preservation estimates. In 2015, according to the Preservation Alliance of Greater Philadelphia, the city provided the least amount of financial support to its historical commission, compared with eight other cities with similar entities. Meanwhile, just 51 properties, including one district, were designated as historic last year — a good start, advocates say, but a modest number compared with the nearly 350 demolition permits issued to private developers that same year. The combination of those issues has led to what preservationists have called a near-crisis — one that has often sent many of them scrambling to save buildings after it's far too late. "When 97 percent of the city is unprotected, you are left in a position of playing 'Whac-A-Mole,' trying to predict where the next threat will be to try to get in front of it," said Paul Steinke, executive director of the Preservation Alliance, a nonprofit agency that advocates for historic preservation and works on historic nominations. "It's a Sisyphean task." The problems that Philadelphia faces have forced officials to acknowledge that the city can no longer let its current process shake out — especially as historic buildings and modern towers both must exist. As a start, Mayor Kenney, honoring a campaign promise, convened a 33-member task force last year to confront these delicate challenges. Comprising planners, preservationists, politicians, and developers, the group is charged with identifying specific problems, reviewing possible solutions, and, ultimately, recommending to the mayor and City Council a road map to a better-protected future. On Wednesday, the task force will release its findings so far, with two more reports expected before the year's end. In fast-changing Bella Vista, preservation and development tensions flared after developer Ori Feibush planned to demolish this church and build townhouses in its place. Preservationists scrambled to nominate the property after Feibush purchased it, but ultimately were unsuccessful in front of the city’s Historical Commission. The 18-page report, the culmination of more than six months of neighborhood listening sessions and research, evaluates how Philadelphia's historic preservation landscape stacks up in four key areas: preservation policies and regulations, property surveying, incentives, and outreach. Philadelphia's biggest strength lies in its preservation regulations, the report says. Unlike many other cities', Philadelphia's preservation ordinance is "easy to locate, well-organized, contains relevant portions of the city's zoning code … and is supported by a searchable database of historic landmarks and districts," the report says. To bolster the ordinance, a regulations subcommittee is reviewing, among other things, the required documentation for historic nominations and "a potential demolition delay process." Other cities have such an option, with Chicago, for example, mandating a 90-day hold on the demolition of certain buildings to explore preservation or alternatives. The corner of Ninth and Locust Streets, where Wills Eye Hospital is razing two corner rowhouses to build a new research and medical-care facility. All other homes on the block are historically protected. Philadelphia does have a strong ordinance, said Harris Steinberg, the chair of the task force and the executive director of Drexel University's Lindy Institute of Urban Innovation. "I sat on the Historical Commission in the early 2000s — it is a deliberative body that enables anyone to participate. If you or I think a building is important and meets the criteria, we can submit an application without the owner's consent. It's a fairly unique and important part of Philadelphia's rules and regulations." Meanwhile, the task force's survey subcommittee found that "while Philadelphia is an old city, it lags behind its peers in the number of designated properties" — and currently lacks any kind of survey or inventory of the city's buildings, making it difficult to know which properties are worth saving. The facade of the Boyd Theater at 1908 Chestnut St. After a fierce fight for its preservation, a developer was ultimately given permission to raze the back of the building but was required to keep the facade. Even more, the report finds, there are no zoning, process, or tax-credit incentives on the local level specifically designed to encourage owners to preserve historic properties. Developers can currently receive either competitive state or federal tax credits — though the federal tax bill signed into law last year diminishes the credits' value, some have argued, by forcing developers to spread the write-off over five years, rather than allowing it to be used all at once. According to Seri Worden, a task force member and a senior field officer for the National Trust, other cities have bolstered preservation incentive packages with tax credits or abatements. Whether Philadelphia's task force will advocate for instituting such a tax credit or amending the 10-year tax abatement to incentivize more preservation has not been decided, Worden said. Beyond considering technical policies that may require legislative changes or increased funding, the task force also is focusing, simply, on how to include more Philadelphians in the preservation process. "The hope of this group is that preservation is not seen as something for a prominent, elite group," Steinberg said. "It's everybody's tool, it's everybody's responsibility, it's everybody's birthright." "This is something that we all own collectively," Steinberg continued. "Let's figure out how we can incentivize people to participate." The task force's next report will identify best practices from other cities and Philadelphia's priorities. The third and final paper, expected to be released in December, will contain specific recommendations for Philadelphia and proposed strategies for carrying them out. The National Trust is providing technical assistance to the task force, and the William Penn Foundation is supporting the project with a $183,750 grant. A portion of Jewelers Row, where home builder Toll Bros. seeks to develop a condominium tower.